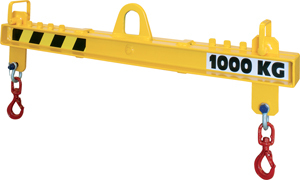 Adjustable spreader beam with 2 rotating and articulated hooks with forged safety latch. These hooks are adjustable by movable hangers. The PALR is manufactured according to standard NFE 52210 and classified as FEM 5. It has exceptional qualities for intensive use.